Enjoy a week-long stay in a 2 bedroom, 2.5 bath villa with a garden view in the exclusive Sea Pines Plantation on Hilton Head Island, South Carolina. This gorgeous villa is rented by the owner who has owned the property for over 30 years. This villa is truly a home away from home. The first level has a full kitchen wish dishwasher and full range, half bath, family room, dining room, full patio with table, chairs and gas grill, on-site washer and dryer and all the amenities you need for entertaining (TV, Cable, Blu-Ray/DVD, CD). On the second level, there is a master suite with full bath and walk in closet and a second bedroom with twin bedrooms with its own full bath. There is also a sleeper sofa on the main level. The unit sleeps four-six people comfortably. The villa has been recently remodeled and is just minutes from the Sea Pines beach and pool, Harbour Town (Gregg Russell and the famous Lighthouse), entertainment, shops and restaurants, Harbour Town Golf Links, just minutes away from elegant shopping, restaurants and there is shuttle to the famous Salty Dog Cafe at South Beach, which is available around the clock. Bike trails cover almost the entire island and bike rental/delivery is a phone call away. Rent bikes and you won't have to use the car again until you leave. There a hundreds of great outdoor activities such as; kayaking, boating, fishing, golf, parasailing, boat tours, zip-lining, etc. Sea Pines Nature Preserve is just a short bike ride or walk away. The historic Beaufort, Charleston and Savannah cities are a short boat or car ride away as well. Parking is available directly in front of the villa and is available the day you get there. 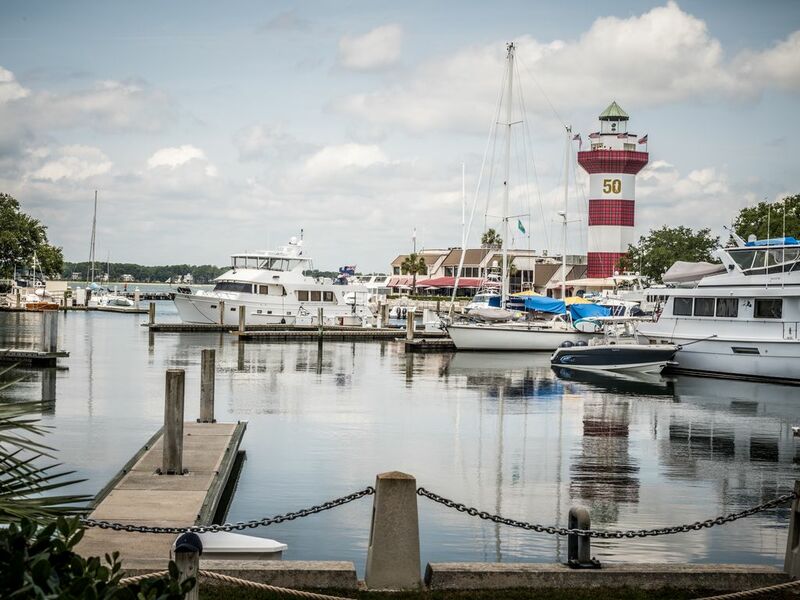 Whether you are simply relaxing on the patio after a day on the beach or visiting the marina and lighthouse, you will experience complete rest and relaxation. Check in at 4pm on day of scheduled arrival. Check out at 9am on day of scheduled departure. For exceptions please ask owner. This beautiful villa has been a part of our lives for over 30 years. It has been a sanctuary for us, our kids, family and friends. Whenever the weight of the world gets to be too much, we come here for a little rest, relaxation, good times and great fun. We certainly hope that you can enjoy all the wonderful things that Hilton Head has to offer while staying with us. Don't forget to head down to Harbour Town for great live music, the entertainment of Gregg Russell and a gorgeous sunset. The villa is only a 45 minute drive from the Savannah airport or a 20 minute drive from Hilton Head Island's own airport. Once here, in the gorgeous, exclusive Sea Pines Plantation, everything is a short walk or bike ride away. The pool is directly across the street. Harbour Town Links and the famous Harbour Town Lighthouse are just a short walk across the way and the beach is a five minute bike ride. There are so many different things to do; bike, live music, beach, kayak, jet ski, fishing, pool, golf, etc. Or just come down for a nice getaway from all your worries. While here, don't forget to check out the great restaurants Hilton Head has to offer. Some of our favorites are; Bomboras Grille, Reilley's Irish Pub, Crazy Crab, Redfish, and Mellow Mushroom Pizza. Or enjoy the many different night spots such as; Monkey Business, Hilton Head Brewing Company, Big Bamboo, and Henchey's. All are just a short bike ride or walk away. We've enjoyed all of them. We hope you do too! Clean towels and linens provided at check-in. Spot immediately in front of villa. Just a few feet from Harbour Town, Greg Russell and Harbour Town Links. Nice place to stay while enjoying your vacation. Conveniently located. It was an easy place to stay as I have friends and relatives in Sea Pines. Great place to get breakfast and walk the harbor. We have stayed here twice now and on both times proved to be the perfect location. We were so comfortable the first time that we had no hesitation booking for a second visit. The villa was immaculately clean and has everything you could want in it, with great wifi and brand new large flat screen TV with cable etc. The beds are really comfortable and the rooms spacious and the bathrooms and showers are clean and functional. Go ahead and book - you won't be disappointed. Just back from Hilton Head for a week of golf. We decided to move this trip from Myrtle Beach to Hilton Head since Ive been going on family trips to Hilton Head for some 27 years. I got lucky in contacting this owner of the villa...ended up knowing some of the same people . The unit was very nice, met all our needs, roomy, clean, great location, and an owner that is willing to make anything right if something is necessary. We would book again in the future. We visited Hilton Head Island for the first time and this was the perfect condo for us! The location was fantastic... literally just steps away from restaurants, shopping and the famous Harbor Town Lighthouse. The villa had all of the amenities that we needed and was spacious, clean, comfortable. The owner was a pleasure to work with, even offering a few suggestions on things to do and see for us "first timers". We would definitely love to stay here again if we ever have the blessing of returning to Hilton Head/Sea Pines in the future. Day Care is available in the summer months. Check in at 4pm on day of scheduled arrival. Check out at 9am on day of scheduled departure. For exceptions please ask owner. Check in at 4pm on day of scheduled arrival. Check out at 10am on day of scheduled departure. For exceptions please ask owner. Rates are subject to change until reservation is confirmed.